Learn to crochet the shells and lace stitch pattern to create your own project with. 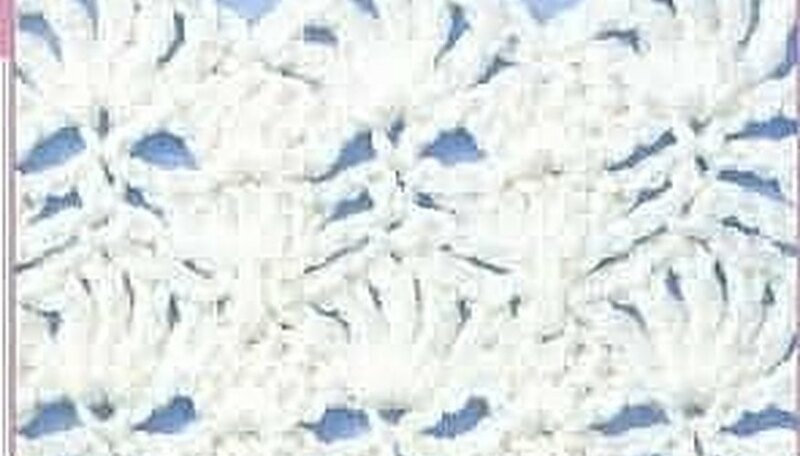 The shells and lace crochet stitch has a multiple of 6 + 2 chains. To work shell: 5 double-crochet in stitch indicated. Row 1:(RS) SC in second ch from hook, * skip next 2 chs, work shell in next ch, skip next 2 chs, sc in next ch; repeat from * across. Row 2: Ch 5 (counts as first dc plus 2 ch), turn; sc in center dc of next shell, ch 2, dc in next sc, * ch 2, sc in center dc of next shell, ch 2, dc in next sc; repeat from * across. Row 3: Ch 6 (counts as first dc plus 3 ch); turn, sc in next sc, ch 3, dc in next dc, * ch 3, sc in next sc, ch 3, dc in next dc; repeat from * across. Row 4: Ch 1, turn; sc in first dc * ch 2, dc in next sc, ch 2, sc in next dc; repeat from * across. Row 5: Ch 1, turn; sc in first sc, (work Shell in next dc, sc in next sc across).